Celebrating a year of prize-winning books Umuzi, an imprint of Random House Struik, is proud to congratulate its authors who featured prominently in this year’s nominations for and winners of literary awards and prizes. This year, seven books published by Umuzi appeared on no fewer than eight shortlists, turning six of these appearances into wins. Among the prize-winners is Imraan Coovadia, whose novel High Low In-Between won the Sunday Times Fiction Prize as well as the University of Johannesburg Prize for Creative Writing. Coovadia’s book was also nominated for the M-Net Award for Fiction. Also on the shortlist for the M-Net Awards’ film category were two crime novels, My Brother’s Keeper by Jassy Makenzie and The October Killings by Wessel Ebersohn, as well as the Afrikaans novel Geldwolf by Carel van der Merwe. Chris Marnewick was awarded the K Sello Duiker Memorial Award for his novel Shepherds & Butchers, while Michael Cawood Green’s For the Sake of Silence won the coveted Olive Schreiner Prize. In Afrikaans, the Eugène Marais Prize went to Carel van der Merwe’s Geldwolf, while Bettina Wyngaard won the Jan Rabie Rapport Prize for her debut Troos vir die gebrokenes. The CitiVibe/Exclusive Books feature event for Wessel Ebersohn’s The October Killings at Montecasino was an intimate affair characterised by a shared passion for writing between the author and the guests. The thriller is Ebersohn’s 9th published novel – but his first in 14 years. In his own words he is now “back in the saddle” after sidelining his fiction writing while working 16 hour days with his wife Miriam getting Succeed Magazine off the ground. Ebersohn remarked how happy he was that he and his “old friend Yudel Gordon” – the prison psychologist who features in this and four previous books – had been reuinted, “returning to the pen” in more than one sense, and in a new South Africa to boot. Many of the guests were aspirant writers and quizzed Ebersohn for words of wisdom; many others had read his previous novels and were back for more. Tom Rymour, the fiction editor for Drum magazine, said he had been waiting in exquisite anticipation for a new Ebersohn work for almost too long , and described him as one of “the two top South African authors”. Mugabe Ratshikuni, who won one of the three book bundle prizes in a raffle, said he was inspired by Ebersohn’s words. “Writing is a lonely pursuit, write for yourself, write what satisfies you and don’t let anyone influence that,” Ebersohn told the guests. 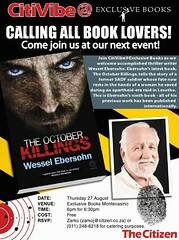 Umuzi is pleased to invite you to a CitiVibe and Exclusive Books event with The October Killings author Wessel Ebersohn. The book – Ebersohn’s ninth – tells the story of a former SADF soldier whose fate now rests in the hands of a woman he saved during an apartheid-era raid in Lesotho. Rule one: Begin with a short sentence. If possible begin everything with a short sentence. That is, every chapter. Read more on this rule. Rule two: You must have good characters. Read more on this rule. Rule three: You need a hero, either male of female. Never a heroine. Read more on this rule. Rule four: You also need a villain. Read more on this rule. Rule five: The story of a thriller has to have a line in the same way that a melody has a line. Read more on this rule. Rule six: While it is true that you must have a hero, there are plenty of different kinds. Read more on this rule. Rule seven: Just as there are many different kinds of heroes, so there are different kinds of villains. Read more on this rule. Rule eight: Your subsidiary characters must be clearly drawn. Read more on this rule. Rule nine: Every chapter in a thriller should get the reader closer to the final climax. Read more on this rule. Rule ten: Never forget the charming bad guys, the kind who beguile the readers and use cleverness, not violence. Read more on this rule. Rule eleven: Remember the flat spots. Read more on this rule. Fourteen years after Wessel Ebersohn’s last novel comes The October Killings, in which thriller and police procedural, action and social commentary are deftly combined. Abigail Bukulu, a young star in the Justice Department, receives a visit from Leon Lourens. Many years ago when she was only 15 he saved her life when he was one of a group of South African soldiers sent to attack an ANC safe house in Lesotho. Having paid the price for his rebellion, Leon now needs Abigail’s protection. On 22 October each year, the date of the Lesotho attack, another member of the SADF squad is killed. Now, that date is approaching, and only two of them remain: the squad commander, who’s serving his sentence in C-Max, and Leon. Abigail immediately knows who is behind the October Killings: a sinister and dangerous man named Bishop who had joined the Struggle for dubious reasons. In a rush against time, over a course with many obstacles, Abigail finds a partner in the eccentric prison psychologist Yudel Gordon, a “veteran” from three earlier Ebersohn novels. And so a fiery partnership is established that is likely to electrify several future books. The October Killings is intelligent entertainment that also draws an honest picture of the ills of South Africa today. Yudel Gordon circled his wife’s kitchen stove. After a considerable struggle he had managed to drag it far enough from the wall to go right round it. He was looking for the fuses. Yudel did not answer. This was a matter of pride. He had asked about stoves at the local hardware store and was trying to remember what the assistant had said. He recalled being advised that the fuses were probably behind a little lid or a flap. Wessel Ebersohn lives in Johannesburg. 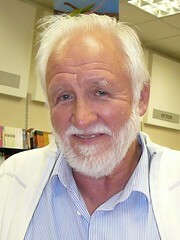 Most of his eight books have been international successes. They include A Lonely Place to Die, Divide the Night, Store up the Anger and Closed Circle. He stopped writing fiction to create, with his wife Miriam, Succeed, a magazine for entrepreneurs. Fourteen years later, The October Killings is his first new novel, with more to follow.